Daniella Rabbani, actress, singer, and a new yorker is currently producing and starring in #GYMSHORTS, a series of Web Shorts. Daniella graduated from New York University’s Tisch School of the Arts with a focus on acting for television. She also studied at The Stella Adler Studio of Acting. Firstindigo&Lifestyle: What productions/premieres did you do recently? 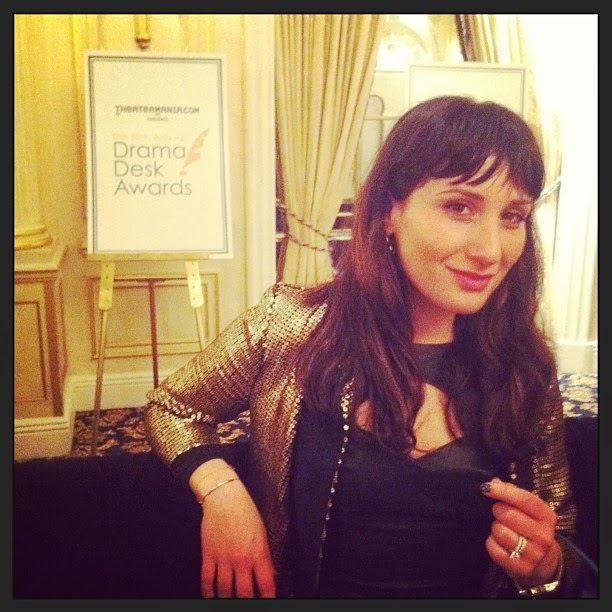 DANIELLA RABBANI: THE GOLDEN LAND, THE OFF BROADWAY MUSICAL I WAS IN THIS PAST FALL WAS NOMINATED FOR A DRAMA DESK! I GOT TO DRESS UP AND GO TO THE NOMINEE RECEPTION AND THE AWARD CEREMONY. IT WAS SO FUN! I’M CURRENTLY PRODUCING AND STARRING IN #GYMSHORTS ABOUT THE FUNNY THINGS THAT HAPPEN AT THE GYM. IT’S AWESOME. I GET TO DO BE REALLY GOOFY WITH SOME OF THE FUNNIEST ACTORS I KNOW AND PUMP IRON WITH TRAINERS LIKE BRETT HOEBEL FROM THE BIGGEST LOSER. IT’S HYSTERICAL. Firstindigo&Lifestyle: Who are your greatest mentors and idols? DR: I’VE BEEN VERY BLESSED IN MY LIFE TO HAVE SEASONED PROFESSIONALS, MASTERS AT WHAT THEY DO, TAKE ME UNDER THEIR WING. I APPRENTICED UNDER THE STELLA ADLER STUDIO’S HEAD OF MOVEMENT, JENA NECRASON, FOR YEARS. SHE TAUGHT ME HOW TO FOLLOW MY INSTINCTS, TO TELL A STORY WITHOUT ANY WORDS AT ALL, TO COLLABORATE AND TO TEACH. I ALSO SING IN YIDDISH. ZALMEN MLOTEK, THE ARTISTIC DIRECTOR OF THE NATIONAL YIDDISH THEATER, HUNKERED DOWN WITH ME FOR HOURS AND HOURS TEACHING ME BEAUTIFUL YIDDISH FOLK AND THEATER TUNES. WE TOURED TOGETHER FOR YEARS. EVEN ARTISTS I HAVEN’T MET YET- GIRLS LIKE GRETA GURWIG, LENA DUNHAM, ZOOEY DESCHANEL, MINDY KALING – GIRLS WHO TAKE THEIR ARTISTRY AND FATE INTO THEIR OWN HANDS- THESE ARE MENTORS TO ME TOO. What is your favorite performance genre, which one do you like more, musical theater, drama or film? DR: I’M INSPIRED TO CREATE MORE WEB-BASED FEMALE DRIVEN COMEDIC CONTENT. I THINK THE WEB IS THE WAVE OF THE FUTURE AND I DIG IT. MY BACKGROUND IS IN THEATER, WHICH I TOTALLY LOVE, AND MY FUTURE IS IN TV (IT’S ALWAYS BEEN MY DREAM). STATING A PREFERENCE IS LIKE PLAYING FAVORITES WITH YOUR CHILDREN… EVERYONE DOES IT BUT IT’S NOT THE TYPE OF THING YOU’RE GONNA ADMIT. Do you tour, how is it different to perform in New York City and elsewhere? DR: I TOUR LESS THESE DAYS. THE LAST TIME I SANG A CONCERT OUT OF TOWN, WE WERE IN WARSAW, POLAND SINGING TO HUNDREDS OF POLES IN YIDDISH. IT WAS INTENSE. BEAUTIFUL AND INSPIRING, SAD AND HAUNTING… I GOT TO GET TO KNOW WARSAW A BIT AND EVEN TOUR AROUND KRAKOW AND AUSCHWITZ… IT WAS A COMPLICATED, LIFE CHANGING TRIP. How do you consider yourself as a role model for young people? DR: WHEN I PERFORM, I TRY TO BE MY FULLEST SELF- BY EMBRACING MY HUMANITY WITH ALL ITS GREATNESS AND EVEN MY IMPERFECTIONS. I HOPE THAT THE AUDIENCE WATCHING CAN FEEL INSPIRED TO LIVE THEIR FULLEST LIVES AS WELL. Daniella Rabbani’s own website. Follow @DaniellaRabbani on Twitter., @drabbani on Instagram.